If you are looking for modern Scandinavian furniture with the minimalist style design, IKEA’s Tarva bed frame is a great product to consider. It features clear and untreated wood of high quality, which is durable and easy to style. As with all IKEA’s products, you are being offered a very affordable price without having the quality compromised. The way IKEA achieves that is by giving you more work to and leaving less work in their hands. That is why all their bed frames come in packages and require assembly. You will be taking on the shipping and assembly tasks, which will save you quite some money on your budget. With that said, in this review, we will go over the details and customers’ opinions on IKEA’s Tarva bed frame. 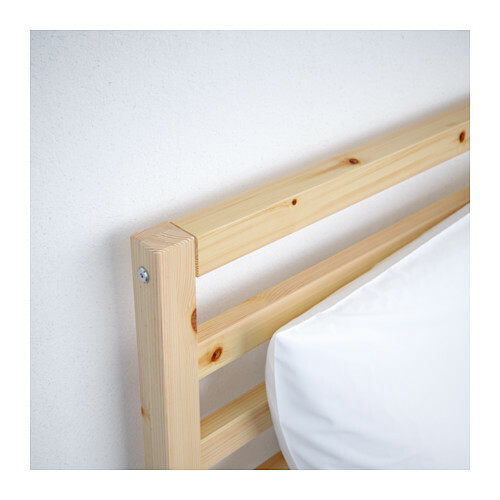 IKEA’s Tarva bed frame is completely made of solid pine, with only its support beam being made of steel. The solid wood gives the frame sturdiness and durability, which you should be looking for when choosing your bedding setup. While the frame is good quality and long lasting, its downside is the fact that it does not have adjustable sides. Meaning, you will have to follow IKEA’s recommendations when it comes to purchasing a mattress since not all of them are going to fit this particular bed frame. 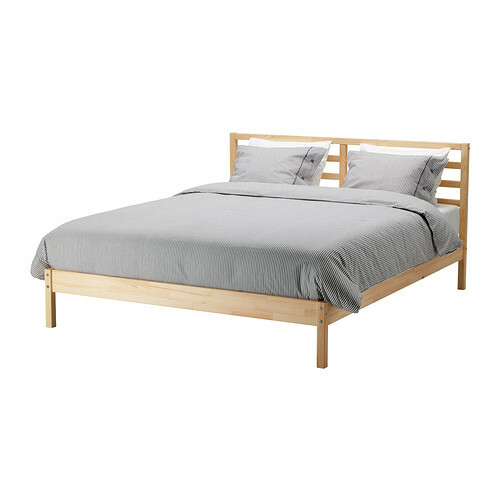 The Skorva midbeam is included in the price of this bed frame. However, if you’re not already familiar with these IKEA products, you should know that the Skorva midbeam comes packaged separately and you have to pick it up from its own shelf. If you purchase the bed frame online, the Skrova midbeam will come included in the package automatically. What is not included in the price is the bed base needed to complete this bedding setup. IKEA recommends the Luroy slatted bed base as the best option for this frame and it will cost you additional 50$. Since the solid pine wood of this bed frame is clear and untreated, you will have to give it the finishing touches. For that part of the DIY, IKEA recommends the Fixa paint brush set which goes for the price of 2.99$ and the Behandla glazing paint at 3.99$. If you were hoping to get some extra storage space with your bed frame, IKEA has thought of that as well. With an additional purchase of Romskog storage boxes, you will be able to store plenty of items underneath your bed while still keeping it nice and stylish. This feature will, however, add more costs since one Romskog storage box goes for 50$, but it is definitely an investment worth making. Finally, the most important IKEA’s recommendation regarding this product is the Haugsvar spring mattress. Since the Tarva bed frame does not have adjustable sides, getting the right mattress is significant for making you bed setup proportional. The Haugsvar spring mattress goes for about 379$ while the price will vary, depending on its size. The Tarva bed frame is one of IKEA’s customizable furnishings that offers not only style but quality at its highest. The clear, untreated wood surface gives you an opportunity to control what your bed frame will look like. You can choose between different wood styles, such as oiled, painted, stained, waxed or lacquered wood. Treating the wood surface will make it more durable while adding some style to it, which is the best combination you want in your bedroom. 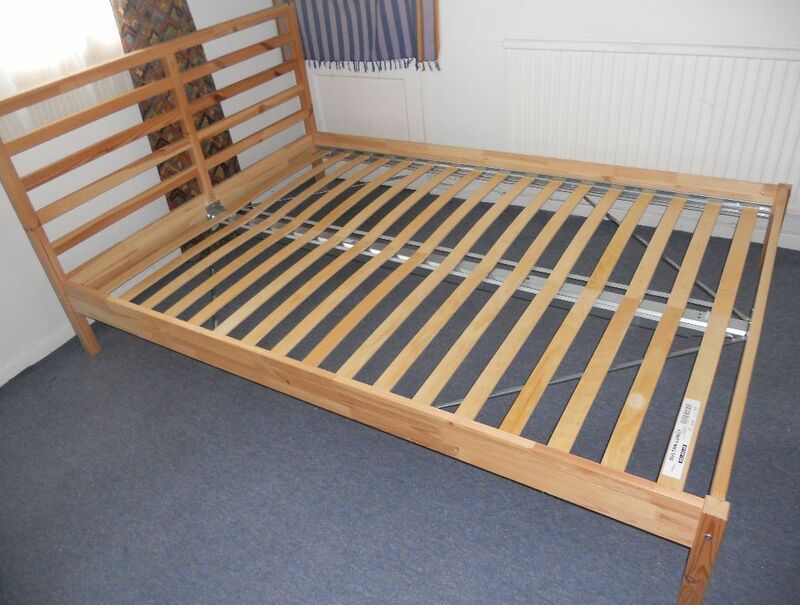 This bed frame is among the higher quality ones. According to the good customers’ review, the wood is high quality and does not splinter. The bed is low on the ground but high enough to fit storage boxes underneath. Keeping it clean is an easy task, since all you will need is a clean cloth and some mild detergent. This bed frame is available in two sizes; queen and full size. It comes in only two packages, which makes the shipping process an ease. As far as the warranty goes, it is same as with all IKEA’s bed frames. If you’re not familiar with it, that is a 25 year warranty that covers only the manufacturing faults. There is no trial period for IKEA’s bed frames as there is for the mattresses. Is IKEA Tarva Bed Frame Good? Undoubtedly, this bed frame is a great solution for your bedroom. It offers style and functionality at a highly affordable price, which you can rarely find elsewhere. With the minor inconvenience of not having adjustable sides, you will be forced to purchase the one mattress that suits the frame, which is the Haugsvar spring mattress. However, with that investment, you will be doing yourself a favor, because this bed frame in combination with IKEA’s recommended products is will give you the best sleeping experience you had in a long time! Undoubtedly, this bed frame is a great solution for your bedroom. It offers style and functionality at a highly affordable price, which you can rarely find elsewhere.